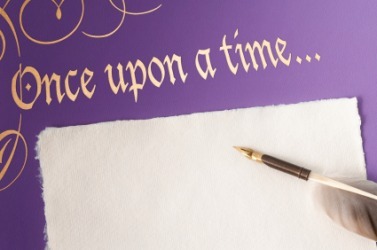 Many a tale begins with "Once upon a time". An example of a tale is a child’s excuse about their missing homework. The definition of a tale is a story, either real or fiction, that is told. An example of a tale is one of Aesop’s Fables. "tale." YourDictionary, n.d. Web. 23 April 2019. <https://www.yourdictionary.com/TALE>. A recital of events or happenings; a report or revelation: told us a long tale of woe. A malicious story, piece of gossip, or petty complaint. A deliberate lie; a falsehood. A narrative of real or imaginary events; a story. Archaic A tally or reckoning; a total. Middle English from Old English talu ; see del-2 in Indo-European roots. (rare or archaic) Numbering; enumeration; reckoning; account; count. (rare or archaic) A number of things considered as an aggregate; sum. (rare or archaic) A report of any matter; a relation; a version. An account of an asserted fact or circumstance; a rumour; a report, especially an idle or malicious story; a piece of gossip or slander; a lie. A rehearsal of what has occurred; narrative; discourse; statement; history; story. A number told or counted off; a reckoning by count; an enumeration. (slang) The fraudulent opportunity presented by a confidence man to the mark (sense 3.3) of a confidence game. From Middle English, from Old English talu (“tale, series, calculation, list, statement, deposition, relation, communication, narrative, fable, story, accusation, action at law”), from Proto-Germanic *talō (“calculation, number”), from Proto-Indo-European *del- (“to reckon, count”). Cognate with Dutch taal (“language, speech”), German Zahl (“number, figure”), Danish tale (“speech”), Icelandic tala (“speech, talk, discourse, number, figure”), Latin dolus (“guile, deceit, fraud”), Ancient Greek [script?] (dólos, “wile, bait”), Albanian dalloj (“to distinguish, tell”), Kurdish til (“finger”), Old Armenian տող (toł, “row”). Related to tell, talk. (dialectal, chiefly Scotland) To reckon; consider (someone) to have something. From Middle English talen, from Old English talian (“to count, calculate, reckon, account, consider, think, esteem, value, argue, tell, relate, impute, assign”), from Proto-Germanic *talōną (“to count”), from Proto-Indo-European *del- (“to count, reckon, aim, calculate, adjust”). Cognate with German zählen (“to count, number, reckon”), Swedish tala (“to speak, talk”), Icelandic tala (“to talk”). It is a tale of ambition and then of guilt. When he finished his tale, she shook her head. Ha, still living in fairy-tale land, I see. On his face, besides the look of joyful emotion it had worn yesterday while telling the tale of the merchant who suffered innocently, there was now an expression of quiet solemnity.